Anti-cholinergic intoxication cuases symptoms of "blurry vision, lightning flashes, disorientation, loss of balance, agitation, and anxiety. It causes ophthalmic signs of bilateral pupillary dilatation and paresis of accommodation." 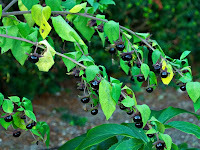 Accidental ingestion of Atropa belladonna berries may cause patients to first consult an ophthalmologist. It is important to recognize the anticholinergic syndrome caused by such intoxication in order to make a proper diagnosis, avoid unnecessary testing, and provide expedient appropriate treatment when required."